Note: This chapter (HOME) is a parent for 3 chapters at level 2. In turn the Whithers general chapter, as represented in the cluster of navigation bars to the immediate left is a parent for 3 chapters at level 3. If searching from the Whithers general chapter at level 2, only the 3 Whithers chapters will be available. 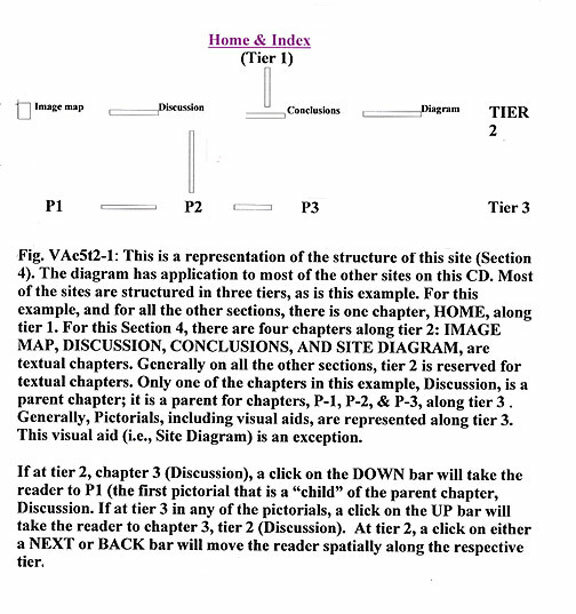 There are similar restraints when searching for chapters at level 3 from either Directory 1 or Directory 2 - both being chapters at level 2; only the children of any one of the 3 chapters at level 2 will be accessible, if the search begins at level 2. For this Section, there is a fourth tier dedicated to Pictorials and drawings. The CHapter Whithers 1 is a parent for one Chapter along tier 4. Whithers 2 is also a parent for one Chapter along tier 4. Hhithers 3 is a parent for 4 Chapters along tier 4. Click to go to VASite1; Click to go to VASite2; Click to go to VASite3. Each of these 3 sites provide access to respective daughter sites at tier 3 but none of the parent sites will provide easy access to all the daughter sites, if reliance is placed solely on the navigation aids: BACK, NEXT, UP, and DOWN. The first cluster of navigation bars to the left is a first level cluster; it provides access to HOME at tier 1 and to all the daughter chapters along tier 2 (3 chapters). The second cluster (in the MasterBorder but immediately below the cluster to the left) is a parent cluster. At tier (level)2 this cluster provides access to the daughter chapters of each individual parent chapter along tier 2; the options change depending on which chapter along tier 2 is in view. Related contributions, The Whithers, are accessible by utilizing the respective image bars in the cluster of navigation aids to the left. The practice of histopathology is a singular procedure in which an individual observer, from his mental reservoirs, imprints his unique perspective onto the real images of histologic sections. The imprints are representative of his stores of relevant information; his individual experience with other similar lesions; his anticipation that a reviewer might be on an entirely different interpretative tract; and his appreciation of the influence of his report on therapeutic options. It is to his advantage to also appreciate the manner in which his degree of alertness might influence his ability to call upon appropriate imprints. These subjective overlays are discussed on this site. The original introduction for this site has recently been published (Seminars in Diagnostic Pathology 25:136-139, 2008). The reader might access the published introduction; it is more detailed than what is available in this chapter on this site. The material on this site deals mostly with melanocytic neoplasia, and the manner in which philosophy impacts on the practice of pathology. It is an aspect of the human condition that what constitutes nature, in all its aspects, is a continuum which can be accessed by man only by structuring arbitrary parcels. The parcelling of phenomena makes the parcels accessible, but only to the degree that the arbitrariness of the parcels has relativity to what is sought by the observer; individuality is introduced once the continuum has been parcelled. This site is structured in 3 tiers. The tiers consist of one or more linear arrays in which the distribution of chapters is sequential; the sequential nature is evident in the numbering of navigation bars in the cluster to the left in the Masterborder. The first tier is a single chapter, HOME. The second tier consists of two chapters (chapters 1D & 2D). Along tier 3, there are 17 chapters in one group and 3 chapters in the second group. Chapter 1D of tier 2 is a parent for 3 chapters (the Whithers 1, 2 & 3). Chapter 2d of tier 2 is a parent for the 17 “Virtual Image” chapters along tier 3. The Whithers were accessible on another web site but, at present, that site is not available. The approach in these 3 chapters deviates from the classic approach to histopathology. Each of the 3 Whithers chapters has a Directory (see navigation aid to the left), and a number of navigation aids. The 17 “Virtual Image” chapters represent an attempt to illustrate what we do in structuring schemata to be used in the interpretation of histologic sections, and in the formulation of therapeutic options and prognostications. They, by providing insight into the structure of the different sections, may be an aid in arriving at an understanding of the navigation bars.